When the students have sorted all the words into the correct rhythm column, alone or in groups, they should choose 4 or 8 of the words and create a word chain with them. They could say the word chain, and add rhythm instruments to create sound effects, or they could play the word chain on the instruments. I like it when the students say it once, and then play and say it. 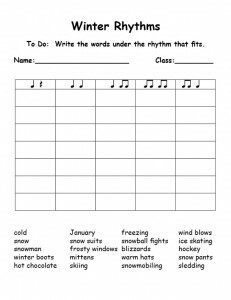 You could create a theme to introduce the word chain compositions: Winter time is snowman time, Winter time is fun. (ss mm ss m, ss mr d) Then, have each student or pair of students perform their word chain as a variation. 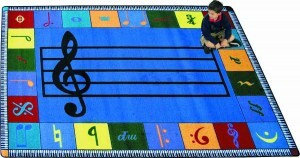 If you teach elementary music, get information on the Musicplay K-6 curriculum at www.musicplay.ca. This entry was posted in Lesson Plans and tagged Denise Gagne, music lesson plan, rhythm lesson plan, winter rhythms lesson plan on January 23, 2013 by Denise Gagne. This list is daunting for an adult! Breaking the skills down, islolating and teaching one skill at a time will help all of your students become successful recorder players. In this newsletter, I’ve got some tips for teaching students to read the names of the notes. Tip #1. 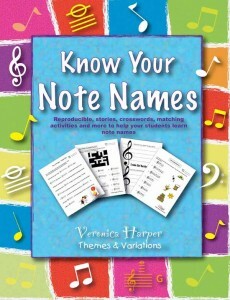 Start teaching note names well before you order or hand out the recorders! Your students in K-2 should learn about the staff as part of their music classes. They should learn how to number the lines and spaces from the bottom to the top, and you can teach them that the treble clef circles the note G. If you review this when you are showing them a piece of music, the note G will be learned long before starting recorder. I like to use the floor staff and the hand staff to teach letter names. A post on Floor staff games can be found on my new blog www.denisegagne.com. In this newsletter, I’ll discuss the hand staff. Hand Staff for K-2: If you hold your left hand in front of you with your thumb up, palm facing you and your fingers spread out, it’s easy to imagine that your hand is a staff. You have five fingers, just like there are five lines on the music staff.. In K-2 have the students point to each finger starting with the finger that is closest to the floor. Number the “lines”of the hand staff. Pointing Game: Call out “line one” or “line five” and have the students point to the correct “line.” Have a student be the leader and call out the line number. Then, point to the space between the fingers. This is the “space.” Call out “first space”or “third space” and have the students point to the correct “space.” Students like to be the leaders of the pointing game. When they are successful at just lines or just spaces, include both lines and spaces inthe game. Transfer the Pointing Game to an actual staff. The cookie sheet staff is fun for the students to use! Letter Names Gr. 3-5: Starting in third or fourth grade, teach the letter names of the notes. I use these poems to introduce the line and space notes. Spaces: Name the first space F, second space A, third space C and fourth space E. Play the pointing game having the leader call out F A C E.
When students are successful at just lines or just spaces, include both lines and spaces in the game. No worksheets are needed to teach or review the note names – just the students hands. (and/or the cookie sheet) You can play the pointing games when ever you have a few minutes at the end of a class. When the students can name the notes successfully, review some of the simple reading songs from previous grade levels by having students sing the letter names that you point to on the staff. (hand staff or a staff drawn on the board) When doing this, introduce some of the easy recorder songs that they’ll be learning to play later in the year. 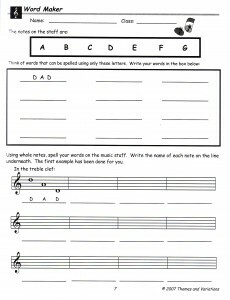 If you are using the Complete Recorder Resource Kit, some of the simple songs that you could have the students sing include Hot Cross Buns or Doggie Doggie. Each of these simple songs are singing games, so after singing the letter names, sing the song and play the game. When you give out recorders later in the year, the students will be able to sight-read the pieces on recorder much more easily after having learned them in the fall. This entry was posted in Recorder on January 18, 2013 by Denise Gagne.